The following article appeared in the Nov. 19, 2001, issue of TIME. Robert Tools, the recipient of the AbioCor artificial heart, died on Nov. 30, 2001. 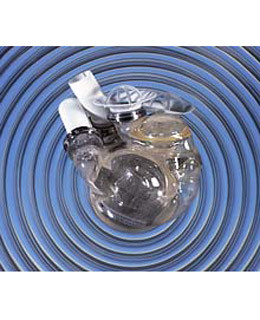 To gauge the impact of the AbioCor artificial heart, you don't have to look much further than Robert Tools. The 59-year-old grandfather and retired technical librarian had suffered from congestive heart failure for two years; by last June he was getting ready to die. His liver and kidneys had nearly quit, and he could hardly muster the strength to lift his head off the pillow. His doctors ruled that he was too ill for a heart transplant. They gave him less than one month to live. But that was before Tools got his robot hearta miracle of medical miniaturization called the AbioCor. Unlike the first generation of artificial heartswhich were attached by tubes and wires to refrigerator-size p unitsthe softball-size, plastic-and-titanium AbioCor is entirely self-contained, save for a wireless battery pack strapped to the waist. On July 2, Tools became the first human to get one. AbioCor's manufacturer, a company called Abiomed, based in Danvers, Mass., decided in advance that the operation would be deemed a success if the patient didn't die within 60 days. It's been more than four months, and Tools' new heart is still beatingor, rather, whirring. "I feel fine," he says. He can walk a city block without stopping. He has been on excursions to an ice-cream store and a barbecue joint. He's even making plans for the future. "I want to do more with my grandsons," he says. "I want to take them fishing and teach them all the things I learned when I was their age." Four more men have since been equipped with AbioCorsone just last weekand the Food and Drug Administration has given the green light for 10 more. Abiomed is working on a new, smaller AbioCor, for women and men with small chest cavities. Not everybody needs a new heart, although hundreds of thousands eventually may. Nor will an artificial heart rid the world of sickness or poverty or terror. But sometimes progress is measured one thin, retired grandfather at a time. For saving the life of Robert Tools and for changing our perception of what is possible, the AbioCor artificial heart is Time's invention of the year.